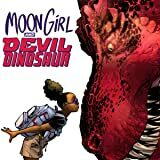 Collects Moon Girl And Devil Dinosaur #25-30. When the Silver Surfer comes to Manhattan with a warning about an ancient cosmic menace on a collision course with Earth, you'd better listen up! But without the First Family of the Marvel Universe around to answer the call, who's going to step up and solve the impossible? Lunella Lafayette, that's who! 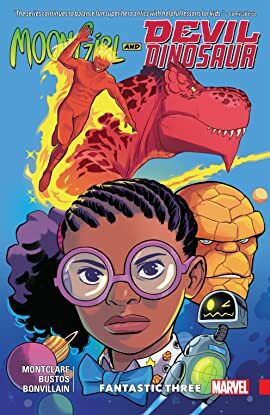 Without Devil Dinosaur by her side, Lunella must join forces with some new friends who are missing their pals, too: the Human Torch and the Ever-Lovin' Blue-Eyed Thing! You don't want to miss the debut of the Fantastic Three! Galactus and the Silver Surfer certainly won't! But who will join the ranks of Lunella's group to complete a truly awesome foursome?